Also Optic Fiber Technology Inc. The Mode Conditioning Patch Cord is designed for long wave (-LX) multimode applications of Gigabit Ethernet. It is compliant with this IEEE 802.3z application standard. The primary function of the Mode Conditioning Cable is to provide an offset launch of the 8.3um single-mode core, into the 62.5 or 50um multimode core. 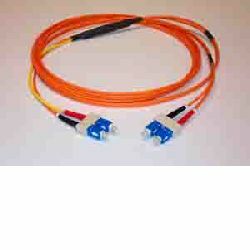 This patch cord consists of duplex connectors on each end of a cable assembly with a single-mode fiber offset to a multimode fiber connection point in between.